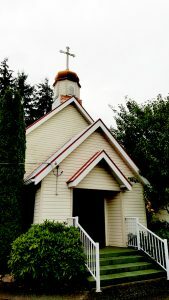 We are St Michael's Ukrainian Catholic Church in Nanaimo, BC. We welcome your inquiries, and invite you to use the links below to contact us. Use our contact the priest form to send mail our priest and parish administrator, Rev. Yuriy Vyshnevskyy. Please note: do not use this form in emergencies. If you need the immediate attention of a Catholic priest, for example in the case of illness or other urgent sacramental need, please phone 778-971-0011 to contact the priest at St Peter's Roman Catholic Church, Nanaimo. If you are interested in renting our parish hall, whether for a one-off or regular event, use the hall rental inquiry form. To contact those who maintain this website, use the contact the webteam form. To subscribe to our parish announcements mailing list, use the mailing list subscription form. St Michael the Archangel, 4017 Victoria Avenue, Nanaimo, BC, V9T 2A5.